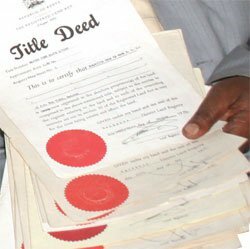 Lenders in Kenya giving out loans against land title deeds can be many, but most of them especially big commercial banks will emphasize on being employed and or running a business for more than six successful months and ask for deeds just as collateral. If for example you have a viable idea and you want to use your deed to get some funding while you are unemployed ,it becomes unacceptable to most lenders .Reason?They just can't trust the way you're going to finance your loan. Read Generally where to find title loans in kenya. Luckily, the few lenders who can lend money after presenting a valued title in Kenya include the following in the list below.In general they give loan amounts at around 50% to 60% the value of you title deed.However, terms do change.If interested just call and and see how they can help. The lender is located at Pension Towers and another branch at Ecobank Towers in Nairobi Kenya. Fairdeal for cash is located along Mfangano Street in Nairobi. This financier is located on 3rd floor CPA Centre KCA University along Thoka Road in Nairobi. If you are employed or have a business in good condition,you can still visit any big commercial banks to secure even bigger sums of loans than the above lenders.